Buying the worst house on the block doesn't hold a lot of appeal for most homebuyers. When you were growing up, you probably imagined buying a quaint cottage with a white picket fence: The prettiest house on the street. Even today, that's the dream of some first-time homebuyers. They want to buy the best house on the block. But buying the worst house on the block is probably a better bet. 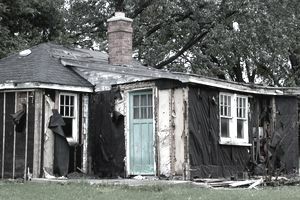 You can buy the worst house on the block among a bunch of other ugly, rundown fixer-uppers, or you can buy the worst house on the best block, among a bunch of fixed up or newer homes. The latter choice is the smartest. You can change a lot about a home -- its curb appeal, exterior, and interior -- but it's very expensive, almost prohibitive, to change the location. There is a reason we cling to the three most important words in real estate: location, location, location. The nicer homes on the street will pull up the value of the worst house on the block after it's fixed up. If a seller had the money or the time to fix up the worst looking house on the block, it would not be the worst house on the block, and it would cost more. Other buyers might pass up this home, calling it an eyesore, which will leave fewer potential bidders for the home. Buying the worst house on the block is often an affordable way to move into an otherwise unaffordable neighborhood. The desirable location will help to ensure the home maintains its value down the road. First, Pick Your Neighborhood: Ideally, you want an area in high demand. The best locations are those that offer residents access to good schools, parks, entertainment options, local interest, and educational opportunities, shopping, and good transportation. Pride of ownership is evident in these types of neighborhoods. Next, Hire an Agent Who Specializes in the Neighborhood: A neighborhood specialist can be invaluable and give you the information you can't get from an agent who doesn't know the area. An agent who sells a lot of homes in this neighborhood will know the history of the neighborhood and be able to give you the downside as well as the upside. Plus, the agent can instantly spot a bargain for you. Look at the Comparable Sales: You'll have the home appraised if you are financing the purchase, but you want to make sure your offer is low enough to make your investment and improvements worthwhile. Get Repair Estimates Before Making an Offer: People who sell the worst home on the block often want to sell that home in its as-is condition. They don't want to renegotiate with you after the home inspection and halfway through the deal. If you get three estimates for every job, you should have a fairly good idea about how much you'll have to fork out to repair the home. Get a Home Inspection: You don't need any nasty surprises after buying the home. A home inspector can spot problems and make suggestions for further inspections. Know exactly what you are buying. Offer Less Than Your Bottom Line: Unless you're competing with several buyers, the seller might accept a low offer. If not, you can leave yourself a little wiggle room to come up in price and meet the seller somewhere in the middle. After closing, don't feel like you have to fix up the entire house at once. Take your time. Mistakes happen when people rush.